Barcelona president Josep Maria Bartomeu insists the LaLiga champions are still competitive without injured superstar Lionel Messi. Barca will not be able to call upon Messi for their Champions League showdown against Inter and the Clasico blockbuster with Real Madrid due to a fractured arm. 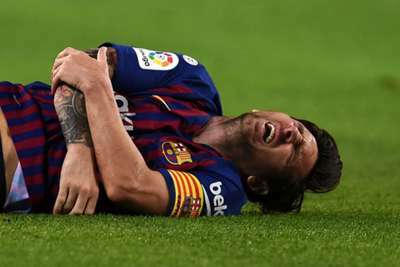 Messi suffered the injury in Barca's 4-2 win over Sevilla in Saturday's top-of-the-table LaLiga clash. Discussing five-time Ballon d'Or winner Messi on Monday, Bartomeu said: "Messi will be out for however long he needs to be. "Without Leo we are still competitive, but the important thing is to move forward. "We have to win, of course, and prepare ourselves. The players are conscious of where they are." Messi has scored seven LaLiga goals for the Spanish champions this season and 12 in all competitions. Barca will host Champions League rivals Inter at Camp Nou on Wednesday before entertaining Madrid in LaLiga on Sunday.